My inspiration for this panel came from my garden. I only have one colour of poppy in my garden, orange. I didn’t quite capture the colour; but it was a good colouring exercise. 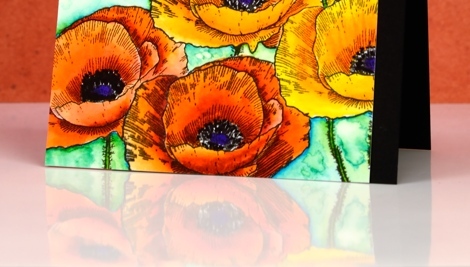 To create the collection of poppies I had to mask several times then stamp over my masks. Fortunately the cutting required for a mask of this poppy wasn’t too fussy! I used zig clean color real brush markers and worked with one orange, one yellow and one red. 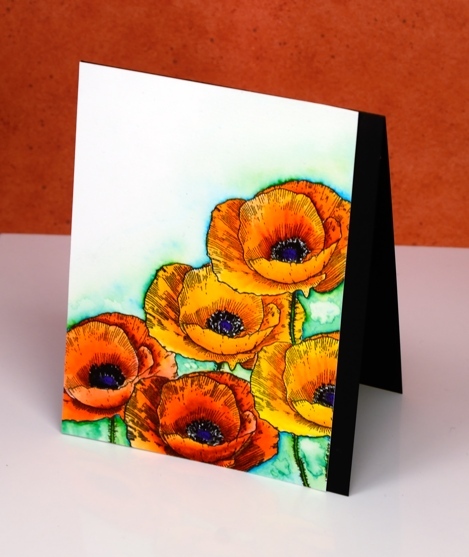 The colours remained bold and bright because I blended with very little water and just worked with a combination of red and orange or orange and yellow. The centres are purple and black. The background is also zig markers, a mix of blue and light green with water marks to break up the brightness and give a little texture. When I photograph my cards I sit them on a piece of glossy cardstock; I like the strong reflection I got this time. I fully intended to add a sentiment in that big empty space in the top right corner but didn’t notice I hadn’t until I was editing my photos. I will wait and see who I send it to and add a sentiment later. 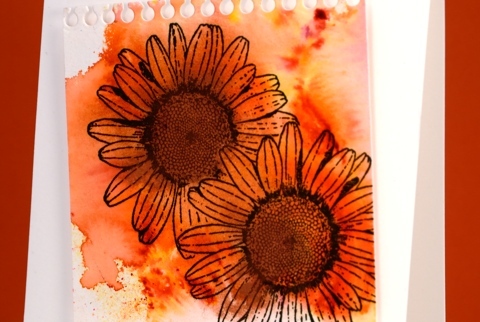 I am enjoying teaching a batch of Alcohol Ink classes at present and we have been having so much fun. The depth and impact of alcohol ink colour is quite something. 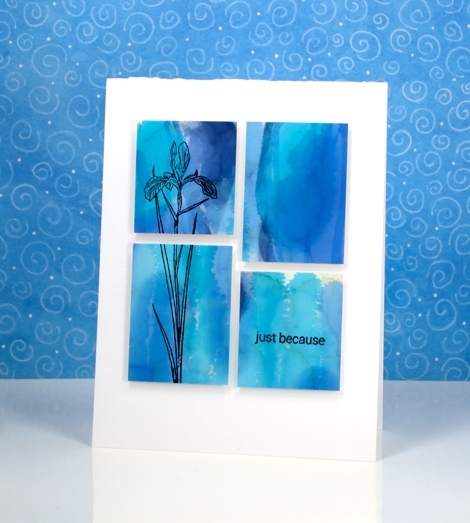 I chose to use these two similar colour panels as background for iris stamps from the Love Art transparent set. 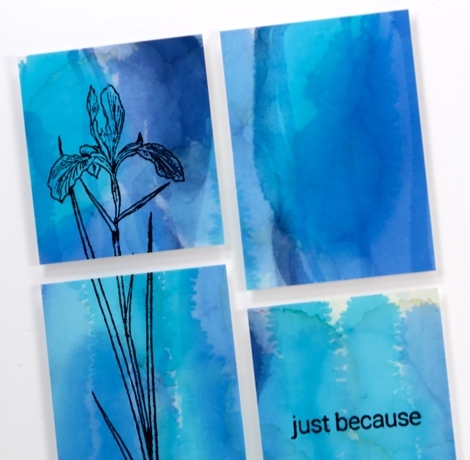 I blended a few blue alcohol inks on photo paper for these two panels. The circle pattern on the one below was achieved using a stencil. I dabbed through the stencil with blending solution to remove colour but also printed the stencil back onto the paper once it was covered in pale blue ink. 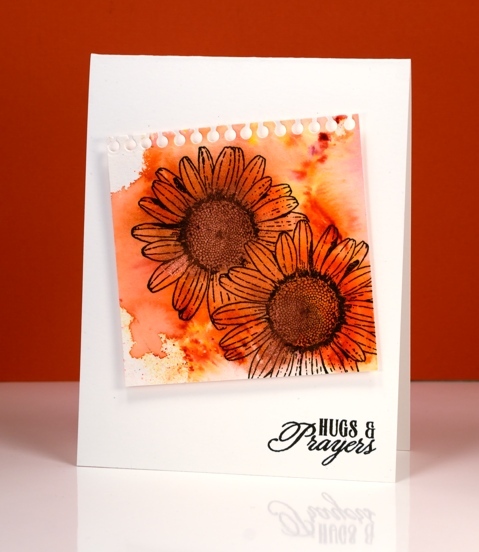 The sentiments and flowers are stamped in jet black archival ink. 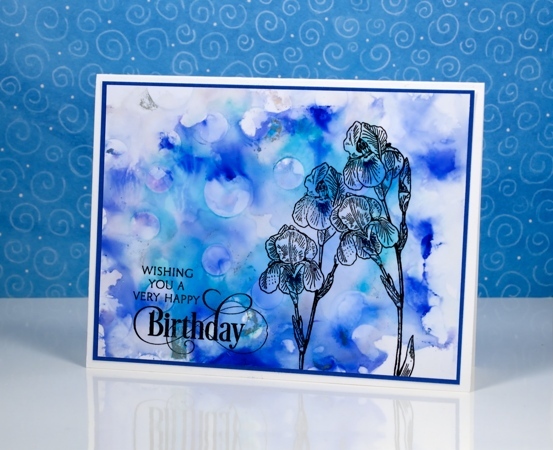 I am just going to squeak this stencilled card into the second challenge at CAS Mix Up; there are twelve whole hours left to participate. 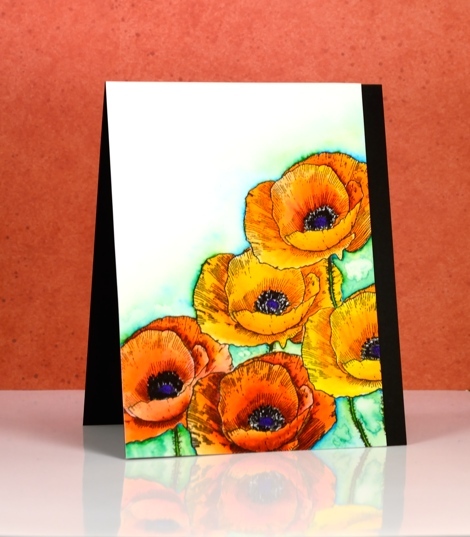 The challenge this month is below; I used alcohol inks as my choice. There is a new challenge on the block and it is definitely worth a look. It has been dreamed up by the very talented, Bonnie Klass and Loll Thompson and it’s called the CAS Mix up Challenge. Is CAS your style?? Do you love the look of clean and simple designs with lots of open space?? 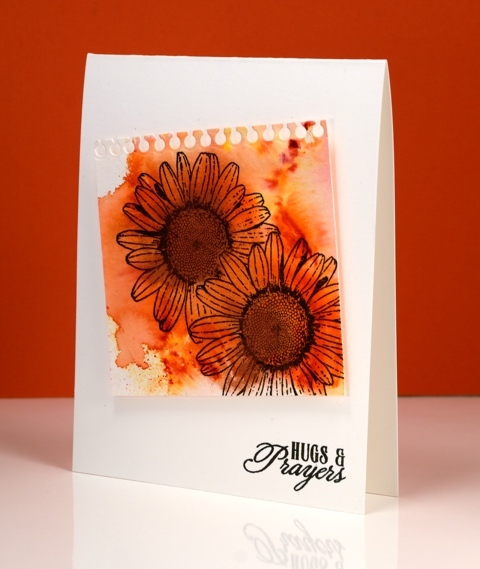 And have you seen all those fabulous mixed media techniques and products popping up all over and want to give them a try?? Then this is the challenge for you! I splashed some water on my watercolour paper then added some Tangerine colourburst powder and some Copper liquid metal. I let the colour move and blend and tilted it to almost fill the paper then let it dry. 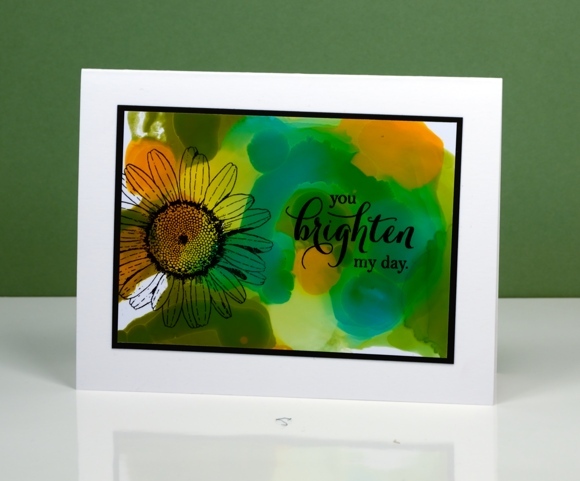 I had to do a little fussy cutting to mask one daisy before I stamped the other but I seemed to have survived the ordeal. 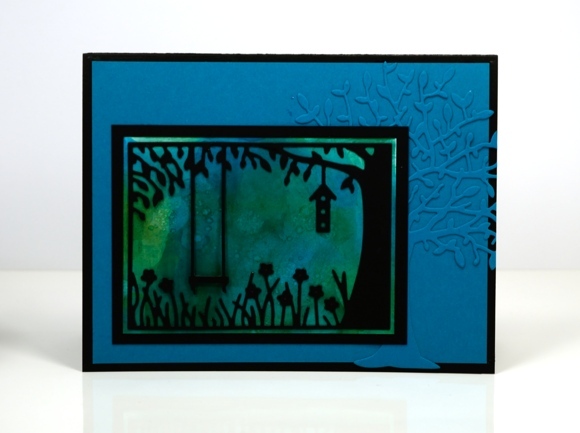 I used the notebook die from the ‘pocket full’ set to cut the top of the panel then popped it up on the card base before adding a sentiment. I tried to do the artistic-messy-thread-stuck-behind-the-panel trick but did not succeed. Maybe it was just as well because the challenge specified three elements not four! Pop over to the challenge and check out the entries; it is a feast of inspiration.